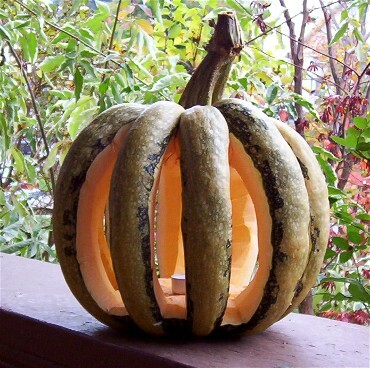 It’s a padana squash, as far as I know, a sort of heirloom Italian pumpkin with awesome ribbing down the sides. J saw it at the Dunbar farmstand and immediately wanted to carve it, and Steve pointed out that it makes good eating, too. So on Saturday J carved it, and we saved the flesh for our soup.To make the soup, all I did was put the cut-up squash bits into a pan, add some water and let it simmer, covered, for half an hour or so. Then I added some chicken stock, let it cook a bit more and pureed the whole thing with an immersion blender. Then I stirred in a little cream. The result was so smooth and sweet that I didn’t feel like adding any seasoning at all. 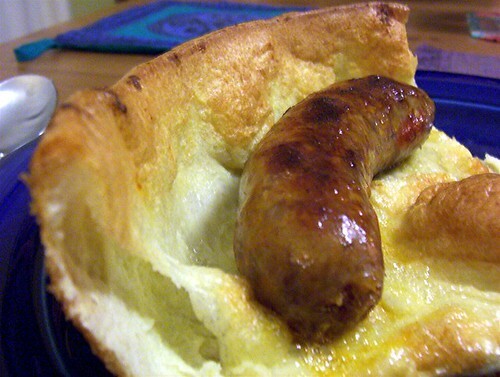 For the Yorkshire pudding, I don’t mess around or experiment – I use the Joy of Cooking recipe. It calls for 7/8 of a cup of white flour mixed with 1/2 tsp of salt. You make a well in the flour and pour in a cup of half water, half milk, and whisk it all smooth. Add two eggs and beat the heck out of it, and let it sit for a while. Preheat the oven to 400°, put an embarrassing amount of butter into either a roasting pan or a large cast-iron pan (Ok, about 4 Tbsp) and put it in the oven until the butter melts. Give the batter another good whisking and pour it all into the hot pan, and stick it in the oven for 20 minutes. Turn down the heat to 350° and leave the pudding in for another 10 minutes. Take it out and eat immediately, rolled around hot sausages and dipped into pumpkin soup. 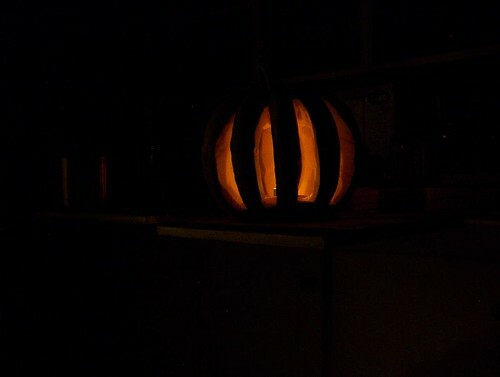 Oh, and the jack o’lantern? I think it came out pretty great. J & J, Nice jack o’lantern! If people are interested in growing their own Padana squash, they can check out “Seeds from Italy” at growitalian.com. 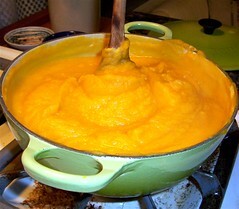 The squash is from the Po River Valley in Northwest Italy.